We have a budding scientist in our home now. Our 7 year old son is fascinated with all things that have to do with the scientific world. He’s like a little encyclopedia, soaking up facts and spitting out random, “Mom, did you know______?” I love it. When he was four he became obsessed with rolly pollies. He would find them, declare that they were lost without parents, and put them lovingly in his (many) bug catchers. Often he would ask me to babysit his beloved find. Let’s just say some of those endeavors didn’t turn out so well. This year we have moved on to caterpillars and butterflies. For anyone who doesn’t know this about Conor, he has an extensive entomology collection that contains numerous preserved butterflies. Our son’s never-ending pursuit to be just like Dad has made him a lover of entomology as well. Last week Caleb found a wooly bear caterpillar hanging out in our front lawn. Excitedly, he brought it inside and put it in a bug catcher with leaves for the caterpillar to munch on (no slice of cherry pie available…sorry, Eric Carle). We then decided to put it in a more suitable place so that he could raise it to become its intended tiger moth self. So a shoe box has sat on our kitchen table for the last several days where we all take peaks at the caterpillar to see how he’s doing. On several occasions he has escaped and we’ll find him somewhere else on the table top, searching for the outside world. Last night I got to wondering about how long this process would take. 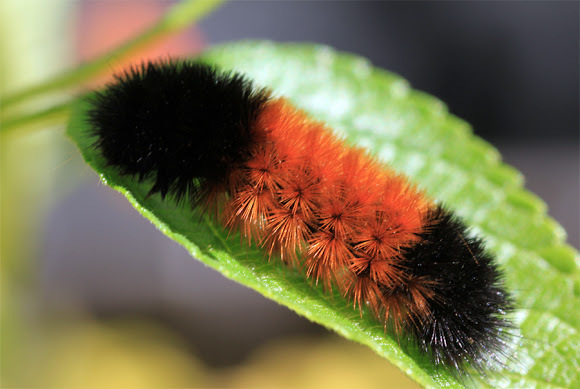 After a few internet searches, Conor and I discovered that wooly bear caterpillars take several months to make their cocoon and transform to a moth, most lasting all through the winter with their transformation in the spring. That’s at least 9 months from now and Conor and I knew immediately we could not keep the caterpillar that long. The website also urged that even though this idea of raising is quite tempting, it’s best to observe the caterpillar from a distance and not rob it of being in its natural habitat. Our home is simply not the best place for this caterpillar to live. So this morning we broke the sad news to Caleb. He protested and tried to find solutions but in the end was quiet about it. And in that moment, I knew we weren’t just talking about caterpillars anymore. What a precious story! He reminds me of Darien and his desire to raise, love and cherish every critter he comes in contact with. It’s a smart Mama that sees beyond the words being shared.